Silly Sour | Brasserie de Silly S.A.
Silly Sour is a unique brew that blends 13% of traditional dark Saison with 87% of soured ale. The delicate malt notes from the Saison manage to break through the striking green apple sourness upfront and than give a way to a finishing jolt of lactic sourness! At an approachable 5.5% Alc. by Vol. this chestnut colored brew adds a new page in the history of Saison brewing. Deep brown hue, sticky head. Deep aromas of melon rind, lemon zest, walnuts, toasted bread, and faint phenols. Modest-sized body, smooth, mild tartness. Apple skin, nutty grain, lemon pith, very light hopping and heavy tannin show a wide range of flavors. Long, bone-dry finish. We get that this is a sour, but while the blending works, the mild astringent character in the end can be a bit much. A worthy sip to change things up. L: Thin dark beige head that dissipated into a ring around the glass right away. Dark, chocolatey brown liquid. S: A heavier scent, kind of toasted malt with a little bit of funk. T: Raisins, lots of raisins. Not getting any sour, just a somewhat syrupy sweetness. F: Tasted kind of syrupy but didn't have a thick mouth feel. O: Really disappointing, this did not seem like a sour at all. Look: Chestnut brown with flashes of red in color; translucent. Pours with a small white head (less than 1 finger) that dissipates immediately leaving scant traces of foam on the surface of the beer. Looks like a typical high volume commercial dark beer; good but nothing special. Smell: Sweet, scent of grains, slight funky/sour aroma. Taste: Sweet and sour taste, a bit of grain. I found it unique and like it. Very good. Fell: A little syrupy; thin to medium in body; low carbonation. Overall: Very good. I found this refreshing, with unique flavor and would gladly drink this again. I liked that this comes in a small bottle. 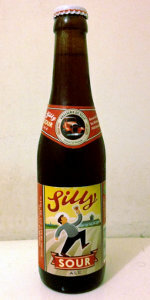 Silly Sour from Brasserie de Silly S.A.